Between puristic ethno music and pop pepped up with folklore elements, there are only few convincing examples of an updated folk music. 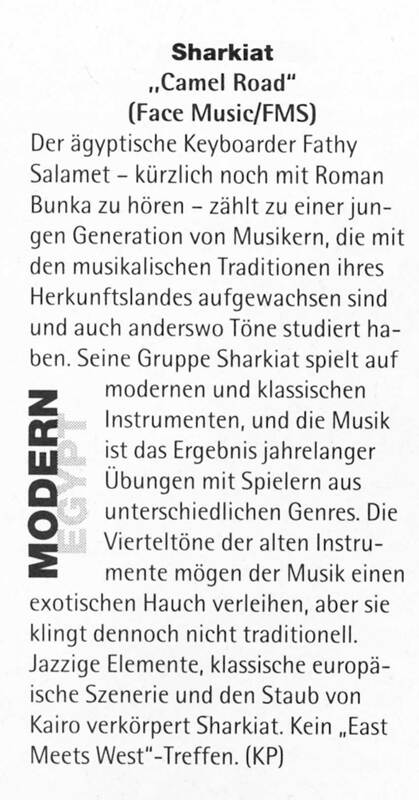 The Egyptian group Sharkiat presents an album entitled "Camel Dance" which is an impressive example of a continuing combination of folklore and pop. Starting from the musically rich local folk music tradition, various elements of Arabic styles are woven together and combined with western jazz runs and pop rhythms. 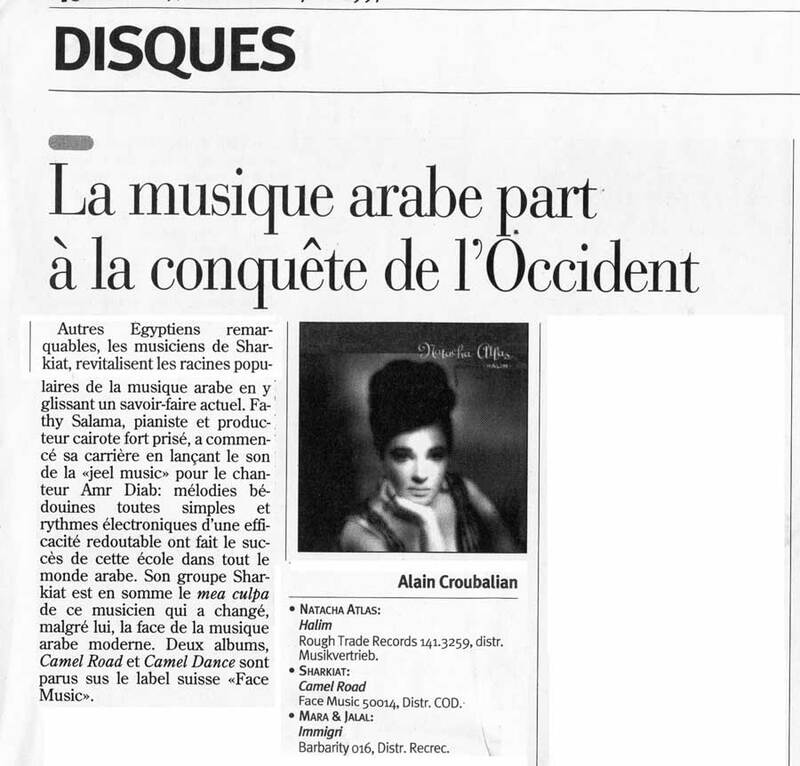 The result is an atmospheric music which in comparison to the similar Algerian Rai is surprisingly varied and yet homogeneous, combining the expressive power of folklore with the catchiness of pop. Accordingly, apart from traditional instruments such as violin and Arabic lute, a sampling keyboard and a saxophone are used. The most impressive groups on Friday evening undoubtedly were "Sharkiat" and "Shikisha". 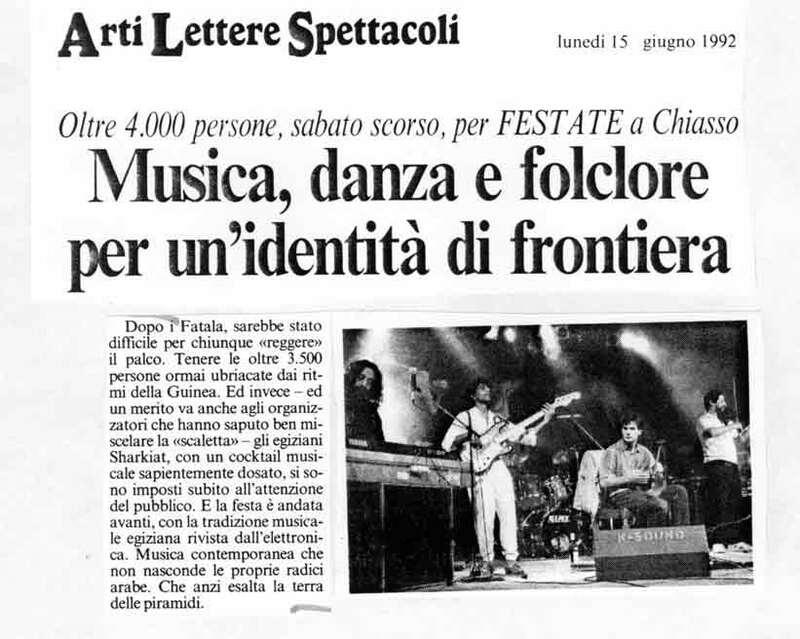 They were announced as "The Beat from Cairo", featuring a conglomerate - according to the programme brochure - of "the roots of their native folk music" and "modern, dynamic pop". This mixture of North African sounds with funk, jazz and a rich groove proved to be a rather wholesome blend at the Stadtgarten. The Israeli Ofra Haza may be used as a comparison. "Sharkiat" is also on a similar tightrope walk between traditional and modern times. Kept in this balance, this does good to our ears which have been trained in the west. This music was for the belly and the legs and created a first highlight on Friday evening. - latest CD: "FM 50006 - Camel Dance", "FM 50014 - Camel Road"
- leader "Fathy Salama" born in Cairo on 13th February 1954, started making music very early in life. 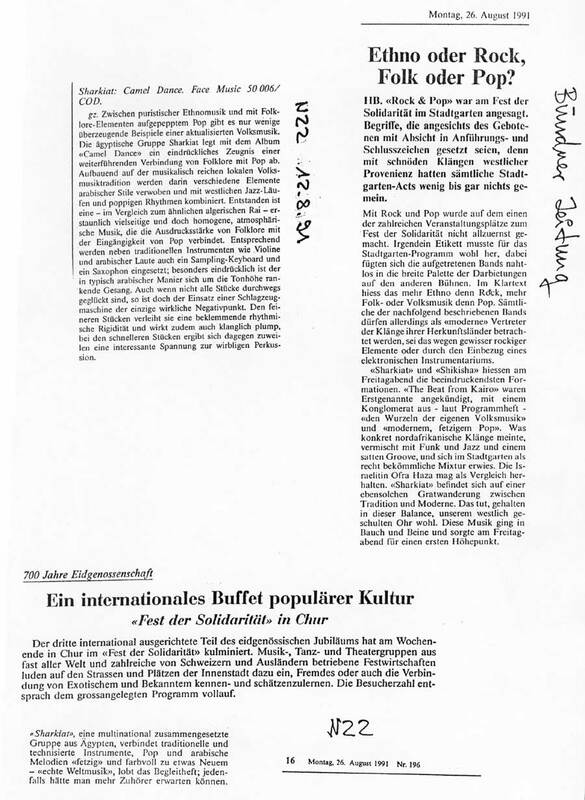 He was already playing the piano at the age of 6, starting by teaching himself classical Arab music. He has been working since 1980 as a full-time composer and arranger for well known singers within the Arab region and for the National Theater in Cairo, but has also taught jazz and improvisation in the United States with such well known musicians as Barry Harris, Pat Patrick (Sun Ra), Hal Galper, and Osman Kareem. His experience with Arab and western music now forms the background for the roots which he has now developed further with Sharkiat. 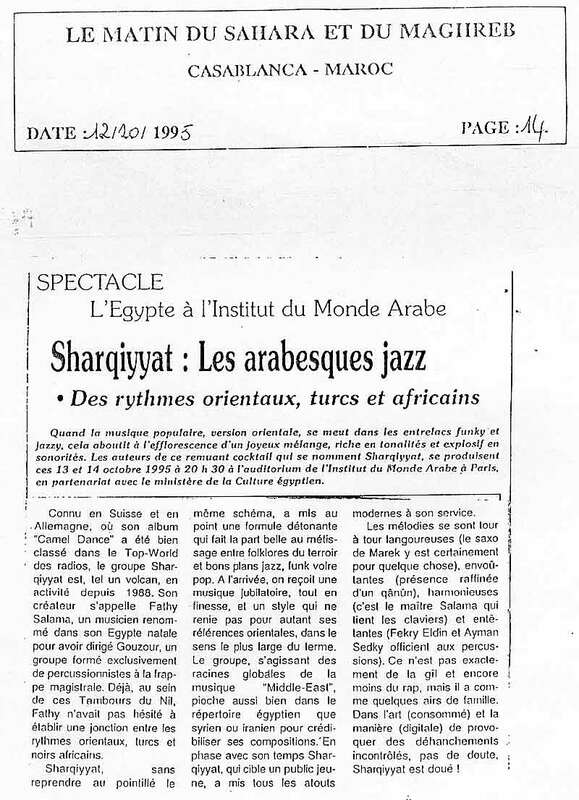 It was with Sharkiat that he first presented his compositions in 1989 and in 1991 found friends in Switzerland who produced his first CD, entitled "Camel Dance". In 1994 Fathy founded his second group, and called it "Gouzour". It performs traditional Arab music with percussion, traditional instruments, and vocalists, and presents the Arab rhythms and melodies of the Sudanese and Nubians and from the Persian Gulf, as well as classical Arab music. 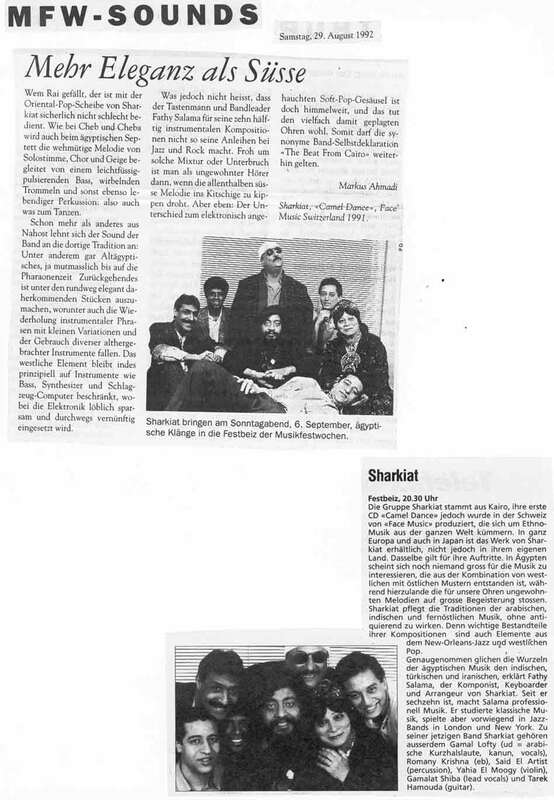 Fathy took his first bold step of presenting an international project when he appeared at the 1994 Berlin Jazz Festival together with Roman Bunka. 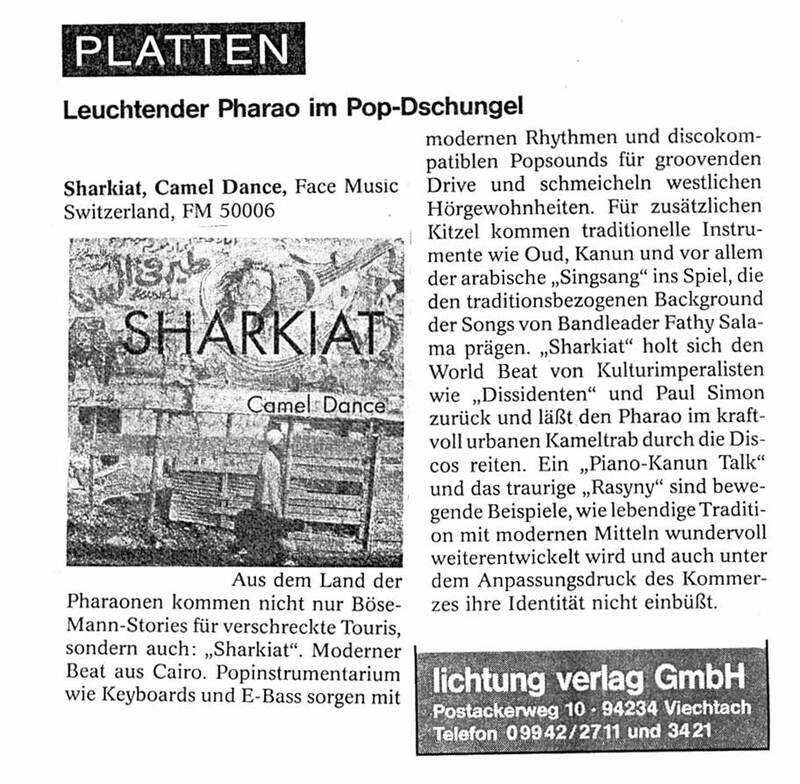 Sharkiat means: "Coming from the East". 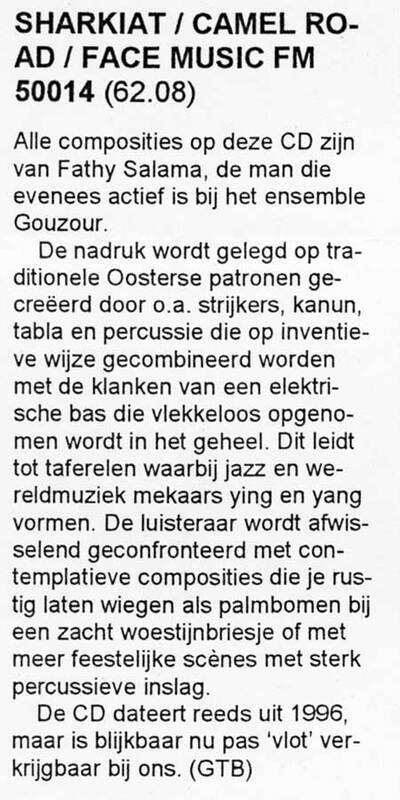 It is with Sharkiat and Gouzour that Fathy is making his dreams come true of merging modern and traditional music together, thus expressing both a message from his home country and his love of music. His music reflects his experience from the Orient and from Europe. His "success" on the music market plays a secondary role; first and foremost he wants to be understood, and so he works tirelessly on this bridge linking traditional and modern music from the Orient. 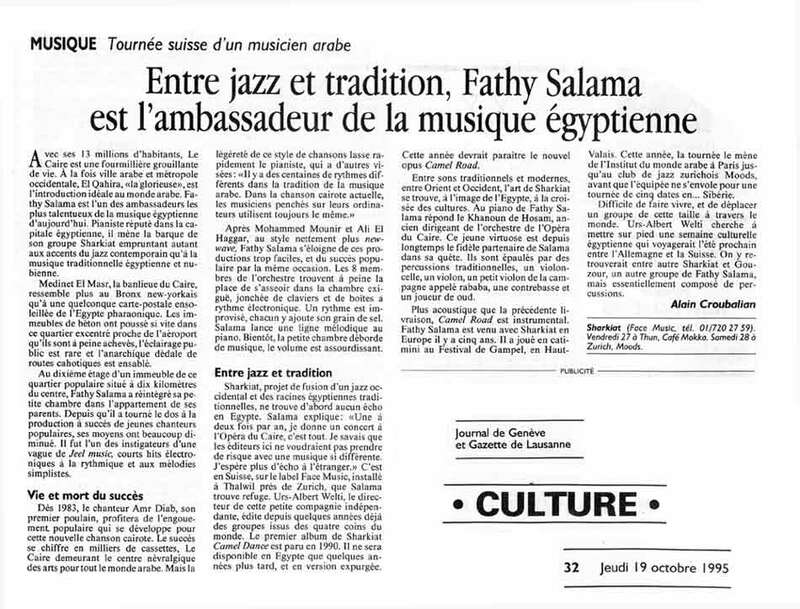 Fathy has given guest performances at club concerts and festivals in such diverse countries as Japan, Spain, Italy, France, Austria, Belgium, Germany, Slovenia, Croatia, Poland, Estonia, and Switzerland. 1996 - Camel Road - Face Music Switzerland.